Unlocking Detention, which starts today, has a very simple aim of bringing detention closer to openDemocracy’s readers and the general public. The mass incarceration of migrants for immigration control purposes in the UK is a growing, though largely hidden phenomenon; the lives of migrants who are detained in the UK every year are out of sight. Yet theirs is a situation that should be of great concern to the general public. Some 30,000 migrants are detained in the UK in immigration centres and prisons every year without a time limit for months, sometimes years. This new series on openDemocracy 50.50 runs alongside an exposé on social media. Over the next four months, members of the Detention Forum, a coalition of organisations challenging immigration detention, will be using social media to ‘tour’ places of immigration detention and encourage people to take a more active interest in the lives of those behind bars. ‘Communications’ is the zeitgeist of the immigration voluntary sector in the UK. With nine months to go until the general election, immigration remains the primary concern of British voters - above the economy and health. A band of communication 'specialists' have assembled to decide what messages can go out and when and via whom. With mathematical formulas they seek to calculate what combination of words and slogans will be most effective at winning hearts and minds. They also decide what the ‘least bad’ immigration narrative is, one that may curb the hostility of voters in David Cameron and Nigel Farage's Britain. People who are in detention - asylum seekers, trafficking victims, ex-foreign national prisoners - rarely feature in such campaign discourse. Nor are they involved in these discussions. But the quality of their lives depends so much on the type and tone of immigration narrative that this country decides to choose. Detention is often seen as a difficult issue and one best avoided, even among those who make it their business to talk about immigration. Yet the overriding discourse of hardworking, contributing migrants who play by the rules and pay their taxes jars with the reality of thousands of incarcerated migrants. These migrants are cheap labour, ‘working’ for £1 an hour by cleaning and cooking to secure the running of the very structures of detention that deprive them of liberty. Their labour is 'illigitimate' since they have no right to work in the UK. They are serving sentences for wanting to stay in the UK, often for better lives. They are not photogenic young migrants who make our cities ‘cosmopolitan’. They are not smiling migrant workers who work in the hospitality industry and care homes. Locked away in detention, they don’t have such opportunities. Yet their story, too, needs to be told. Away from the glitter and the glamour of TV appearances, radio interviews, broadsheet column inches, unpopular immigration enforcement issues such as detention, deportation and immigration raids, particularly of men, go on unnoticed unless they churn out utter tragedies, such as deaths. Only yesterday, we heard that a man died in Morton Hall in Lincolnshire, followed by disturbances at the centre. After the media show is over, how soon will it be before Morton Hall disappears from people’s consciousness? The authors in this series want to shed light on the lives in detention and remind people that detention continues to exist day to day, even when noone is looking. The lack of public interest in detention is sometimes blamed on a lack of access by journalists to detention centres, or a lack of publicly available information. While journalists might not have access to the centres, monitoring bodies such as the Independent Chief Inspector of the UK Border Agency report abundantly on various practices which happen within the otherwise inaccessible detention estate. People who have been in detention are repeatedly asked - and kindly oblige - to talk about their experiences, most recently at the first oral evidence session of the Parliamentary Inquiry into Immigration Detention. It was impossible not to be moved by their powerful words, including those of us who have heard similar stories many times before. Many of us personally and individually witness what detention does to people, maybe because we visit such people in detention, because we support people who are released from detention, or because we simply have a human connection with people and communities who have experienced detention. So if some - albeit not all - the information is available, why do the general public remain oblivious to detention? Why are we not seeing public outrage, as long professed in Australia or Israel in the face of similarly violent practices of border control? The fact is that while the information it there, it is not necessarily reaching people. We live in a world of constant conflicts, miseries and scandals and, as such, getting people to focus on immigration detention is terribly difficult. For many, suffering is something that happens to refugees ‘over there’, not in our own communities. To know that just miles from the airport lounge people languish behind bars on suicide watch is too much for us when we set off on holiday. Yet it is the banality of detention that poses the threat as much as the extreme cases that occasionally make the Sunday supplements. In the context outlined above, there are two questions that we might reflect upon when seeking to communicate detention: what do we mean by ‘detention’, and how do we reconcile a plurality of voices to forge a popular agenda for change? The first issue concerns the following dilemma: might we be doing those in detention a disservice by presenting detention as something that only happens inside detention centres? Because of the extreme nature of the practice of migrant incarceration – deprivation of liberty – it is often portrayed as an exotic misfortune, an isolated anomaly in the human repertoire, something that happens to a small minority of people. Yet ‘detention’, considered in terms of its impact, is a national practice of incarceration which involves thousands and thousands of people, scattered across the UK. They include not just the 4,000 locked up indefinitely in immigration removal centres and prisons at any one time, but also those who have had the misfortune of having been detained in the past and who now live, unsupported, in the community. Around 10,000 leave detention to re-join our communities every year. An analysis of the impact of detention might also include the family and friends of those held inside; charities and local groups who support people in detention; and campaigners who oppose detention. We can also include those who work in the detention estate as security guards, escorts, healthcare staff, religious figures; ‘non-profits’ who provide services under government or detention centre contracts and the security companies and Prison Service who run the centres. Detention is a significant part of the UK’s immigration control system costing us hundreds of millions of pounds each year; it is big business. 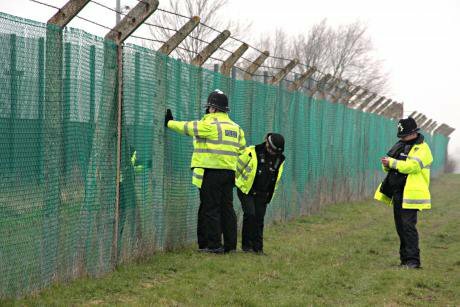 The Home Office wastes some £75 million alone per year by detaining migrants who are ultimately released. The phenomenon of detention also includes the Home Office case workers, immigration judges who hear bail applications and decide the fate of those detained, solicitors both good and not so good, various monitoring bodies who keep checks on the conditions of detention and the politicians who created, maintain and protect this system of mass incarceration. And let’s not forget a mushrooming industry of migration scholarship which gazes at the practice of immigration detention and the bodies that are caught up in it. When considered from this angle, detention appears a vastly claustrophobic enterprise affecting not tens of thousands, but hundreds of thousands. It cannot be locked into the detention estate for it is much bigger than that – but are we doing enough to explain, let alone capture its scale and genealogy? The second issue concerns those of us seeking to challenge the practice of immigration detention. For we are often not clear ourselves, beyond ‘detention is bad’, what exactly we want to say. As this series will demonstrate, with so many different stakeholders involved for different reasons, it is inevitable that immigration detention turns out to have competing narratives which simply do not neatly cohere. As with any social movement: the debate lies on both sides of the negotiating table. Some authors in this series will focus on privatisation and the involvement of private security companies in detention management. Others will focus on specific vulnerability, women, children, victims of trafficking, torture survivors – the list goes on. Some will broach the contentious issue of a ‘scale of the deserving’, asking whether, as some imply, the detention of innocent asylum seekers is a more heinous practice than the ongoing detention of ex-foreign national prisoners who have committed - but atoned for - a crime. For other writers the key issue will be one of policy and practice: for example the lack of enforcement power of the Her Majesties Inspectorate of Prisons whose many recommendations to the detention centre management and the Home Office remain unimplemented. It is hard to think what the priorities should be when too many problems are identified simultaneously. Yet authors in this series are united in one aim: to challenge detention. Unlocking Detention seeks to give a platform to explore migrant lives out of sight, offering critical perspectives and debate on immigration detention in the UK. In doing so we seek to stimulate debate that will progress our thinking about solutions and ideas about an alternative world without detention. As much as possible we will try to find and pass on what people with experience of detention have said and several authors will speak directly from their experience of immigration detention. For, when coupled with the privilege of not having to worry about being detained and not being subject to immigration control, nothing should stop us from speaking out about immigration detention, bar the need to maintain the confidentiality of the individuals concerned whose turmoil and trauma to which we have borne witness.